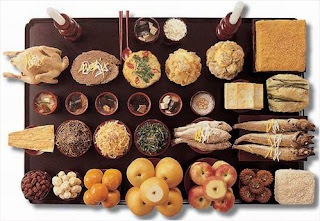 "Chuseok falls on August 15 of each year with lunar calendar.It is like Thanksgiving day in western culture.On this day, people can see the brightest full moon of the and we normally prepare some food with newly harvested crops to eat and offer our memorial service to our ancestors. We normally visit our ancestors grave yards in advance to cut the grass on the graves and grave yards and visit there on the Choosuk day to offer our memorial service.In our culture, we normally make a half moon shaped rice cake of which we call as 'Song Pyun' and this name is originated from the way we cook them because we normally put pine leaves first on the pot and then, put uncooked song pyun on it to cook with steam in order to enjoy the aroma of the pine tree which is penetrated into those song pyun." 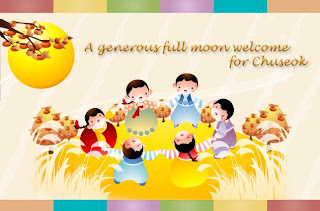 8th month of the lunar calendar. 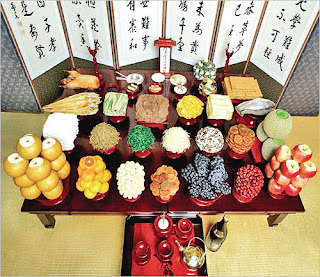 Like many other harvest festivals, it is held around the Autumn Equinox. As a celebration of the good harvest, Koreans visit their ancestral hometowns and share a feast of Korean traditional food such as songpyeun and rice wines such as sindoju and dongdongju .